The hair and beauty industry has an annual turnover of £6.2 billion a year and employs over 277,000 people. Over 93% of hair and beauty salons are small businesses with no more than 10 employees. In this article, we explain what insurance hairdressers and beauticians in the UK need and review hair and beauty insurance companies. How do I get hair and beauty insurance? How much is mobile hairdresser insurance? How much is public liability insurance for a mobile beautician? If you’re a self-employed freelance hairdresser or beautician, who works alone, you don’t have to have insurance; however, taking into account the potential risks of using hairdressing and beauty tools, and the hundreds of pounds you could be set back if your equipment was ever lost or stolen, an insurance policy might be hugely beneficial in the long run. Most insurers will give you the opportunity to tailor your cover to your needs. The most important type of cover is public liability that includes treatment risk, which some insurers do separately. Public liability insurance is not a legal requirement but is purchased by most self-employed professionals to protect them against legal claims made by members of the public. It will help with legal costs if something goes wrong; for example, someone is injured on your premises. If your liability cover extends to cover treatment risks it will also help if you burn a client with a hair straightener while doing their hair, or you permanently damage an item of personal property, and they sue you for compensation. Most hair and beauty insurance policies will have that extension to their liability cover or offer separate cover to help with legal expenses if a treatment goes wrong and a client sues. You might also be able to select cover for specific treatments, such as massage, eyebrows threading and tinting, make-up, etc. Employers' liability is a legal requirement if you hire staff, have volunteers or apprentices. It will protect you if an employee got ill or injured while performing his or her professional duties and sued for compensation. Tools and equipment cover can save you thousands of pounds if your expensive hairdressing equipment or mobile massage table are lost or stolen. Some policies will even extend to cover tools and equipment in unattended vehicles. Tools and equipment cover can give you peace of mind that if your tools or equipment are ever lost, stolen or damaged you will not suffer severe financial losses as your insurer will cover the costs. Stock and supplies cover is useful if you are a small hair and beauty business and store products, such as hair dyes, massage oils, etc. This will help cover the costs if anything is ever damaged or stolen. Product liability insurance will cover you in case a client has an adverse reaction to a product they bought from you and sued for compensation. Business interruption insurance will pay out to cover loss of income, including employees’ wages if you are forced to cease activity due to unforeseen circumstances that are outside of your control. This is useful cover for both hair and beauty professionals and small businesses. Personal accident cover will pay out to cover medical expenses incurred if you are ever injured while carrying out your professional duties. Professional indemnity is a level of cover available in only the most comprehensive policies. It is worth considering if, as a beauty therapist, you make recommendations and give advice about beauty care to your clients. If you happen to make a recommendation or give advice that results in an adverse reaction the client can sue you for compensation. Professional indemnity can cover any legal expenses incurred as a result. Use a specialist insurance broker such as the Salon Gold or Professional Beauty Direct. Most trade bodies offer some level of insurance to their members. Hair and beauty professional bodies include, British Association of Beauty Therapy and Cosmetology (BABTAC), Hairdressing and Beauty Salon & Barber Association, The Guild of Beauty Therapists, among others. BABTAC has a range of membership packages. Full therapist membership costs £99.83. Salon membership with two members costs £183.71, and £232.49 for three members. The insurance they offer their members is very comprehensive and well suited for salons or professionals who hire more staff or have a higher turnover. It comes with £6m of cover for public liability, £6m of cover for professional liability, £6m of cover for malpractice, £6 of cover for treatment risk and £30,000 of product liability insurance for selling products to people who are not your clients. The NHF is the UK’s largest trade body for hairdressing, barbering and beauty. They offer a 20% discount on salon and barbershop insurance, powered by Coversure, for members. The NHF offers four membership packages, Salon for £269 per year; Group for £269 (you can add up to four more for £136 per extra membership per year); Solo for £147 per year and Trade membership for £160, suitable for education providers and suppliers. The NHF is a good source of legal and professional support with comprehensive guides to anything from marketing to renting chairs in salons, freelancing, and running a small business. The Guild is a professional trade body for beauty therapists, holistic therapists, nail technicians, and therapy lecturers. Membership gets you added to the relevant professional registry. They have four membership branches: The Guild of Beauty Therapists, The Guild of Holistic Therapists, The Guild of Nail Technicians and The Guild of Therapy Lecturers. Members of the guild can join these for free. The cost of membership to the Guild, however, is not indicated anywhere on their website. Simply Business is the largest online comparison service for business insurance; if you enter your details it will return quotes from several providers. We got a quote for a mobile hairdresser in Milton Keynes that needs £5m of Public liability cover. The cheapest price we were shown was £73 and the most expensive £163. This does not include any cover for personal accident, employers’ liability or tools and equipment. Prices correct at March 2018. Salon Gold is an insurance broker that provides insurance for people in the hair and beauty sector. They insure hairdressers, barbers, make-up artists and beauty therapists if they are freelance and mobile. They can also provide insurance for salons. We got a quote for a freelance mobile beauty therapist, based in Greater London. The price of the insurance policy was £53, and it included £3m for public liability; £3m for treatment risks and £10,000 for financial loss. We were presented with optional add-ons for specific treatments, personal accident and other levels of cover. Compared to purchasing insurance for your small business through a specialist broker, a trade body or a comparison website, buying from a general insurer can be simpler. If you're a self-employed mobile hairdresser or freelance beautician, this can be a great option for you. BABTAC’s insurance is underwritten by Zurich. Unlike many policies on the market, they will cover a claim arising from a treatment years later if at the time of the treatment you were insured with them, even if you are not with them at the time of submitting the claim. The NHF has partnered with insurer Coversure to provide its members with a 20% discount on insurance for salons, barbershops and spas. Their insurance is more comprehensive and might be suitable for larger salons and beauty businesses. They have a price match process, and, on their website, they promise that if their price isn’t lower than your current premium, they will match it less £20. Chair-renters get £20 off in addition to their 20% discount. To get a quote for Coversure’s salon insurance you need to fill out a form on their website. They say they will contact you within 48 hours. They cover a wide range of hair and beauty treatments. To get a quote you have to first register and then fill out the quote form after which you’re going to get your quote via email. In our research, carried out in March 2018, the cheapest price we found for mobile hairdresser insurance was £57 and the most expensive £874. The exact price depends on how many optional add-ons you purchase with you cover and their limits. For example, a quote from Salon Gold, for public liability insurance for a mobile hairdresser insurance was £57, but when we added one apprentice, cover for tools and equipment, personal accident, legal expenses and employers’ liability, it went up to £215. Our quotes were for a mobile hairdresser in Greater London with £5m of public liability. In our research, carried out in March 2018, the cheapest price we found for mobile beautician insurance £62 and the most expensive £762. For example, a quote from Salon Gold, for public liability insurance for a mobile hairdresser was £62, but when we added one apprentice, cover for tools and equipment, personal accident, legal expenses and employers’ liability, it went up to £253. This did not include any add-ons for specific treatments. Our quotes were for a mobile beautician in Greater London with £5m of public liability. 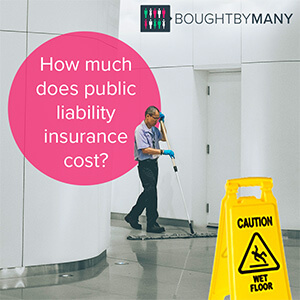 Learn more about the costs of public liability insurance here.